M.F. Cohen, J.C. Meeks, Y.A. Cai, and C.P. Wolk, Tranposon Mutagenesis of Heterocyst-Forming Filamentous Cyanobacteria. J. Yu and L. McIntosh, Isolation and Genetic Characterization of Pseudorevertants from Site-Directed PSI Mutants in Synechocystis 6803. K.L. Kindle, High-Frequency Transformation of Chlamyomonas reinhardtii. G. Fritzsch, Obatining Crystal Structures from Bacterial Photosynthetic Reaction Centers. H.G. Koch, H. Myllykallio, and F. Daldal, Using Genetics to Explore Cytochrome Function and Structure in Rhodobacter. J.H. Goldbeck, Comparison of in Vitro and in Vivo Mutants of Photosystem I: Protocols for Mutagenesis and Techniques for Analysis. J. Sun, A. Ke, J. Ping, V.P. Chitnis, and P.R. Chitnis, Isolation and Functional Study of Photosystem I Subunits in the Cyanobacterium Synechocystis sp. PCC 6803. R.E. McCarty and J.A. Cruz, Delineation of Critical Regions of the Epsilon Subunit of Chloroplast ATP Synthase Through a Combination of Biochemical and Site-Directed Mutagenesis Approaches. J.H. Zeilstra-Ryalls, M. Gomelsky, A.A. Yeiliseev, J.M. Eraso, and S. Kaplan, Transcriptional Regulation of Photosynthesis Operons in Rhodobacter sphaeroides 241. C. Jansson, G. Sailh, J. Eriksson, R. Wiklund, and H. Ghebramedhin, Use of Synechocystis 6803 to Study Expression of a psbA Gene Family. P.P. Dijkwel, F. Rook, and S.C.M. Smeekens, Analysis of Light-Regulated Gene Expression. A. Cohen, C.B. Yohn, R.K. Bruick, and S.P. Mayfield, Translational Regulation of Chloroplast Gene Expression in Chlamydomonas reinhardtii. S. Rodermel, Use of Antisense Mutants to Study Regulation of Photosynthesis During Leaf Development. D.G. Durnford, O. Prasil, J.M. Escoubas, and P.G. Falkowski, Assessing the Potential for Chloroplast Redox Regulation of Nuclear Gene Expression. G. Armstrong and K. Apel, Molecular and Genetic Analysis of Light-Dependent Chlorophyll Biosynthesis. M. Harker and J. Hirschberg, Molecular Biology of Carotenoid Biosynthesis in Photosynthetic Organisms. J.M. Quinn and S. Merchant, Copper-Responsive Gene Expression During Adaptation to Copper-Deficiency. D.M. Kehoe and A.R. Grossman, Using Molecular Genetics to Investigate Complementary Chromatic Adaptation: Advances in Transformation and Complementation. W.F.J. Vermaas, Gene Modification and Mutation Mapping to Study the Function of Photosystem II. H. Lee, S.E. Bingham, and A.N. Webber, Specific Mutagenesis of Reaction Center Proteins by Chloroplast Transformation of Chlamydomonas reinhardtii. T.M. Bricker, C. Putnam-Evans, and J. Wu, Directed Mutagenesis in Photosystem II: Analysis of the CP 47 Protein. B.A. Diner, Application of Spectroscopic Techniques to the Study of Mutations Engineered in Synechoceptis and Chlomydomonas. Author Index. Subject Index. 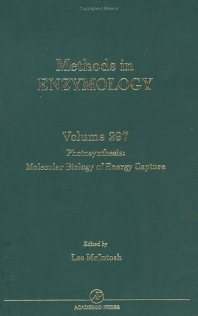 General Description of the Volume: The articles in this Methods in Enzymology volume reflect the integration of molecular genetics with photosynthesis. They focus on the genetic engineering of the photosynthesis apparatus, new mechanisms for genetic selection of photosynthetic mutants, biophysical and biochemical analysis of Photosystem I and Photosystem II Mutations, and Photosynthetic Gene Expression. General Description of the Series: The critically acclaimed laboratory standard for more than forty years, Methods in Enzymology is one of the most highly respected publications in the field of biochemistry. Since 1955, each volume has been eagerly awaited, frequently consulted, and praised by researchers and reviewers alike. Now with more than 300 volumes (all of them still in print), the series contains much material still relevant today--truly an essential publication for researchers in all fields of life sciences. Plant biochemists, plant molecular biologists, biotechnologists, plant geneticists, plant biophysicists, agricultural researchers, researchers in industrial plants, and graduate students in botany and plant biology. Department of Energy, Michigan State University, East Lansing, U.S.A.